Nowadays, in the field of internet or online marketing, ‘affiliate marketing’ is a popular term. In affiliate marketing, affiliates can earn money by promoting the products or services of other people or companies in return for a commission on the number of sales made. But have you heard about the new type of affiliate marketing where people get paid even if they don’t make a deal? Yes, it is true. Well, it has been possible by a new wave of affiliate marketing flowing through the web, known as ‘CPA Affiliate Marketing’ or just ‘CPA Marketing.’ Now you can earn money online with CPA Marketing. 1 What is CPA Marketing? 1.1 Why CPA Marketers Get Paid Without Selling Anything? 1.4 How Much Does CPA Marketing Pay? First of all, we should know, what is CPA marketing? The full form of CPA is “Cost Per Action.” It is an online marketing strategy and a type of Affiliate Marketing, which usually involves the publishers or marketers in generating leads for companies. In return, for each lead, those companies give them a payment. It differs from the typical affiliate marketing in that it is not necessarily needed to make a sale to get paid within a CPA network. CPA is also known as Cost Per Acquisition (CPA). It often concentrates on leads rather than sales, but not entirely. Signing up for a newsletter, etc. Why CPA Marketers Get Paid Without Selling Anything? Yes, this question can come to your mind that how do the CPA marketers make money online without selling anything? If the customers don’t buy anything, why do advertisers pay the CPA marketers? It’s because by generating leads, the CPA marketers drive new customers to the advertisers’ website. New customers are the driving force behind any business. The advertisers pay the marketers for the leads in the hope that these new customers will purchase something from them in the future. The CPA marketers connect potential buyers with various businesses. How Much Does CPA Marketing Pay? In the CPA payment method, payment is given for leads. Usually, an amount for each lead varies. Depending on the offer, you can expect from $1 to $6 per lead. For a single email capture, most of the CPA companies pay in between $4 to $25. In other competitive markets such as insurance market, for life cover offers, you will get $22 per lead. If there is a multi-part process to be completed, you can expect to get paid up to $150. The payout in CPA marketing depends on how complicated the action to be performed is. So how to get started with CPA marketing? Well, it happens in stages. At this point, you may be thinking, how to sign up for CPA networks? You will need to sign up as an affiliate or a publisher and have to fill up an application form. You should join a CPA network, which is well-known, paying on time, legitimate and stable. To know about the best CPA networks for beginners and to gain some knowledge about the marketplace, you can head over to ‘AffPaying.com,’ which is an affiliate network review site. This site would give you lots of information about the affiliate networks, including their payment methods or referral commission. You can search for the specific CPA network, which you intend to join. You should pay attention to the rating distribution of the system. You can also use the site ‘oDigger.com’ and get the reviews about the networks. Click on the ‘Network Reviews’ tab from the home page and search for the network you are willing to join. Once you have checked out, you can decide which network you would join. Now the question arises, how to get accepted into a CPA network? Unfortunately, getting approved for the CPA networks is not as easy as getting received in regular affiliate marketing networks. Honesty is a pretty important part of the application. They usually review applications manually, and if you can’t satisfy them by providing necessary information, they will reject it. Remember that CPA networks aren’t trying to make things difficult. They want to make sure that you are honest and will send them real leads. So it’s a matter of being transparent with them. It’s necessary to fill out the form with real information such as the actual name, right address, date of birth, etc. CPA networks want to remove the scammers but not the newbies. So, always try to be honest. Tell them about your niche you want to work in. Also, try to learn about the methods of driving traffic as you will need to state what techniques you will be using to make traffic to the offers. It is highly recommended to create a niche website or blog of your own before you start working. A blog is so much more than just your identity. It will serve as a way for you to practice your writing techniques, and aside from that, you can post samples of your work on your blog for your prospective clients. A platform for your business. This will build your credibility. A way for clients to hire you. Some CPA networks check to see if the ‘Whois address’ of your site matches your email address. If you have experience in any internet marketing or Cost Per Action marketing, that is fine. If you are a newbie, then say so, but you also need to ensure that you are learning techniques of the business. You have to inform them about your plans and methods you are going to work on. Once you have filled out your application, it will take 24-48 hours for the network to call you. But it is strongly suggested that you call them before they call you. To get your application approved more quickly, wait for 10 minutes after submitting the form and give them a call. Let them know that you have applied. This will show that you are eager to get started and you care about the CPA network. After getting the application, the CPA network will want to know about you, your experience and pretty much the same questions that were already asked in the form. They want to find out who you are. So, at the time of the interview, stay confident and be honest in your answers. 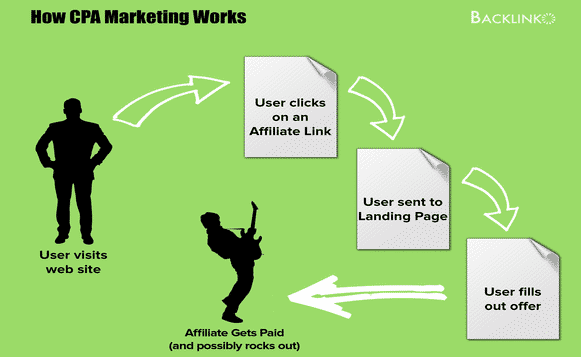 You will get an affiliate link as soon as you get accepted into a network. It will be a unique link. It will be used to track all of your future activities, for example- your sales. You will also get information about your conversion rates through it. When you join a network, a CPA affiliate manager is going to be assigned to you. This is to help you to get started off with the program. You can ask the manager if you have any queries regarding the CPA campaign that you might have. But don’t ask any question that is not directly related to their network like building up your website or setting up a Google Adwords account. Remember that this person is significant for you as he/she has all the answers regarding your business. So, try to build up a good relationship with him/her. After joining a CPA network and deciding on a specific niche, you should find CPA offers to promote related to the niche. You can do this by asking your affiliate manager. They have a lot of data, and they are ready to help you. They will send you a list of offers, and you can go through the offer pages and decide for yourself what offer you would select. You can also go to the site ‘Offervault.com’ or ‘oDigger.com’ to find the offers. Next, you should do a bit of research on which offer the general public has the highest interest. To make money with CPA offers, it is essential to know about the public interest. An easy way to do this is to use the tool ‘Google Keyword Planner.’ So go to the Google Keyword Planner and type the keywords or product offer names into the search section. Then just click on search. The search results will give you an idea about what people are searching for on Google and the volume of traffic that you can expect for those offers. It will help you to select products easily. Another useful metric is to check out your CPA network’s Earnings Per Click (EPC) and Conversion Rates (CR) for the offers. You should avoid CPA offers that have low EPC or no EPC. Conversion Rate should be minimum $1. When you have joined a network and have chosen a CPA offer, it is time to integrate it into your site. If you can incorporate these offers in a way that people can hardly understand you are promoting CPA offers, more people will click and get converted. So, it is recommended that you get a custom design that gives your site a legit look. As a CPA marketer, when you choose traffic sources to promote CPA offers, first ensure that the offeror accepts the type of traffic source to the advertiser. If you see the offer details of your CPA network, you will find specific types of traffic sources are acceptable. For instance, Banner, Email, Social Media, Search, etc. In the field of CPA Marketing, the real big players are those who can send high quality targeted traffic to any CPA offer. Email marketing and list building is the most basic and essential key to CPA marketing. In your email marketing campaign ideas, selection of e-mail software can make a huge difference. It can save you from all the hazards and time-wasting moments. Top email marketing service providers are Campaign Monitor, Aweber, GetResponse and MailChimp. Tracking is essential in CPA Marketing. If you don’t bother learning how to follow CPA Campaigns, then you can’t understand what is working and what is not working on your campaigns. ‘Google Analytics’ is the most popular free analytic tool and it works very well to help you analyze which things are working best for your campaign like keywords, ads, etc. You can also keep track of sales, conversions, and revenue of your campaigns by using paid tracking software like Voluum, CPVLab, Prosper202, etc. In CPA Marketing, things are still moving fast, and competition is high. So, you have to run fast too. Stay up-to-date with the necessary information and tools. Learning is also an essential part of CPA marketing. Join a CPA marketing forum like CPA Elites, Warrior Forum, CPAHero.com, etc. to share experiences, knowledge, and advice. These are some of the many challenges that you can face when selecting the right niche for CPA, and all of these are crucial to quality performances. Therefore, if you can successfully tackle each topic, your project will have a good end and you will have run your work successfully. Hope the tips mentioned above will help you a lot in getting started to make money online with CPA marketing. Keep in mind that to be succeeded in this field, it requires a great deal of hard work, wit, dedication, and perseverance. Never lose your patience. Also, learning is a continuous process of CPA marketing. So, try to bring together valuable information, techniques, and strategies from different sources and thus enrich yourself. And of course, before actually applying to a CPA network, build up a personal website or a blog around your favorite niche. It will not only ease your future steps but also portray your dedication to CPA marketing.